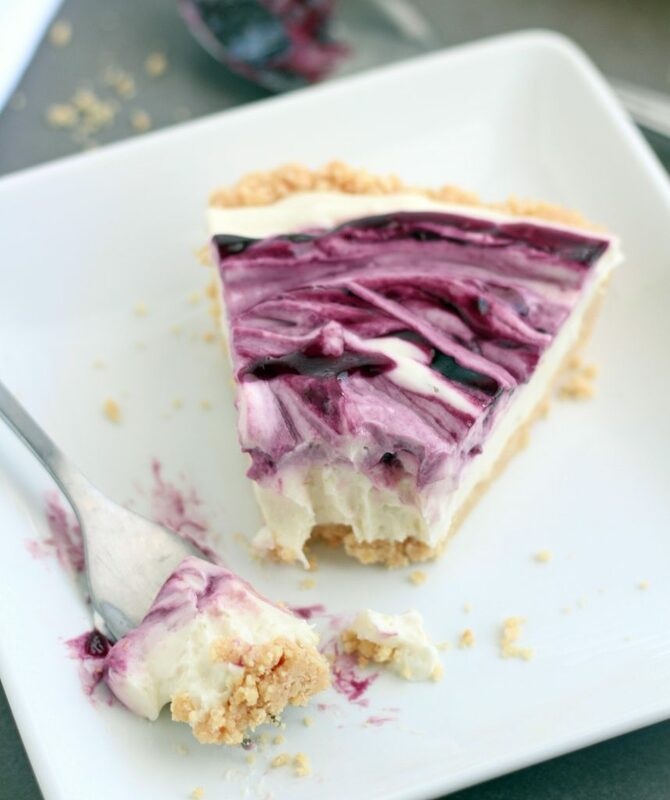 Creamy, velvety and completely delectable, this No Bake Black Raspberry Cheesecake is heavenly. Simple to make, it’s the perfect dessert for any occasion. Mother Nature is really teasing us here in Utah. It was 60 degrees yesterday, definitely not typical February weather in Salt Lake. I’m sure in a few days it will be a blizzard, so I’ll enjoy every second of the sunshine and blue skies while it lasts. 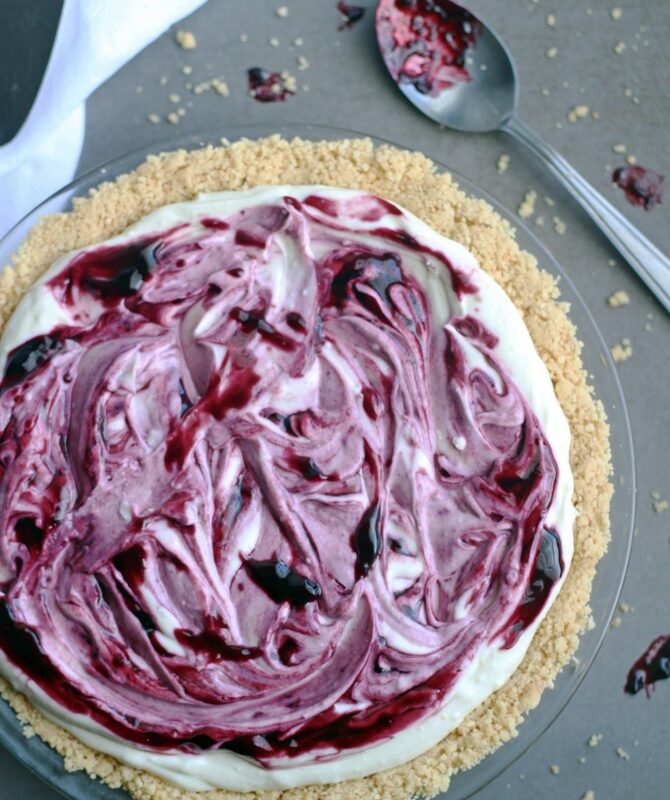 The weather has definitely given me spring fever, so I made a Black Raspberry No Bake Cheesecake. After all, isn’t that what a person does when they’re sick of winter and ready for spring? Well, it’s what I do. This no bake cheesecake is smooth, creamy and velvety, with just the perfect amount of sweetness and a hint of tang from the lemon juice. Oh and the Golden Oreo crust is completely fabulous! My boys were in heaven eating this and obviously so was I because, duh, there’s sweetened condensed milk involved here. This is so simple to make, it comes together in about 20 minutes. It does have to be refrigerated for several hours or overnight so make sure you plan ahead. If you’ve got spring fever or the winter blues, this cheesecake is a definite cure-all for that, I promise. You could easily swap out the black raspberry preserves for raspberry, blackberry or boysenberry. Any of those would be delicious! In the bowl of a food processor pulse cookies until fine crumbs. (You can also put them in a Ziploc bag and crush them with a rolling pin). Pour into a medium bowl and add melted butter. Mix until combined. Press into the bottom and up the sides of a 9-inch pie plate. Put in freezer for 15 minutes. In a large mixing bowl, beat cream cheese at high speed until smooth. Add the sweetened condensed milk for and mix until well combined. Add lemon zest and lemon juice and beat for about another minute. 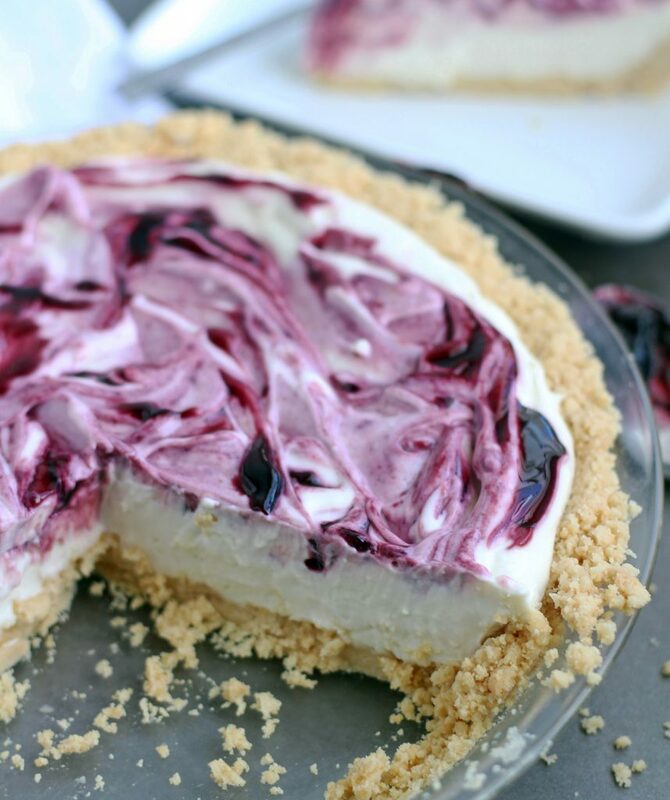 Remove crust from freezer and pour cream cheese mixture into the prepared crust. Melt the black raspberry for a about 15 seconds in the microwave. Stir until smooth. Spoon over cream cheese mixture and swirl gently using a knife. Cover and refrigerate at least 5-6 hours, but preferably overnight.